The Russian government has a reputation for occasionally being unpredictable. Now, the UK Russian Embassy Twitter account seems to be acting in a similarly erratic manner, after it posted a screenshot from classic PC strategy game Command and Conquer: Generals to illustrate extremist activities. 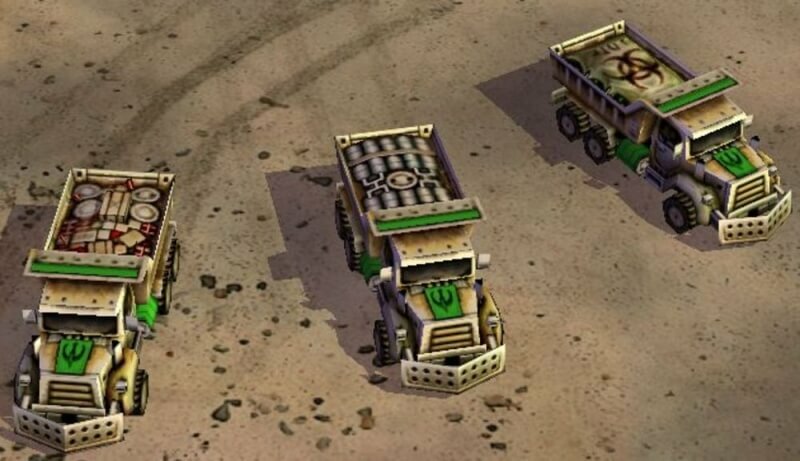 The image shows the three variants of suicide bomb truck used by the GLA in the game – basic, high explosive, and bio bomb. Beneath the screenshot, the embassy wrote: "Extremists near Aleppo received several truckloads of chemical ammo,” displaying a shocking lack of knowledge about the iconic game’s units. In fairness, the picture is the first one that appears when you type “bomb truck” into Google. The Embassy also added an "image used for illustration purposes only” message to the picture, for those people who have trouble distinguishing between a photo of a real truck and a mass of pixels from a 2003 video game. Being Twitter, there were plenty of creative responses from users who added their own “illustration purposes” photos to news stories. Only an hour earlier, the same @RussianEmbassy account had used an image from the excellent zombie horror movie Dead Snow to illustrate the country's stance against Nazism. And zombies, presumably. This from a nation whose government isn't exactly well known for its sense of humor. In all seriousness, using screenshots from games and movies to illustrate real-life crisis is pretty questionable. It’s also not the first time a Russian organization has done this; in 2014, a segment on child soldiers by news channel Russia Today was introduced using an image from Metal Gear Solid 5: The Phantom Pain.